I made a stop into Collabor88 over the weekend to pick up this hair from Fashionably Dead, and it’s perfect because it comes with leaves that you can wear in your hair! Collabor88 also had this skirt from Pixicat and the bench, candles, and wine are from Dust Bunny and the kitten in the basket is from O.M.E.N and Dust Bunny which is all available at Collabor88 until the 7th. My shirt is from Tres Blah and my jewelry is from Amala and Zaara. My pose is from Glamrus poses and the curtain is from Junk. 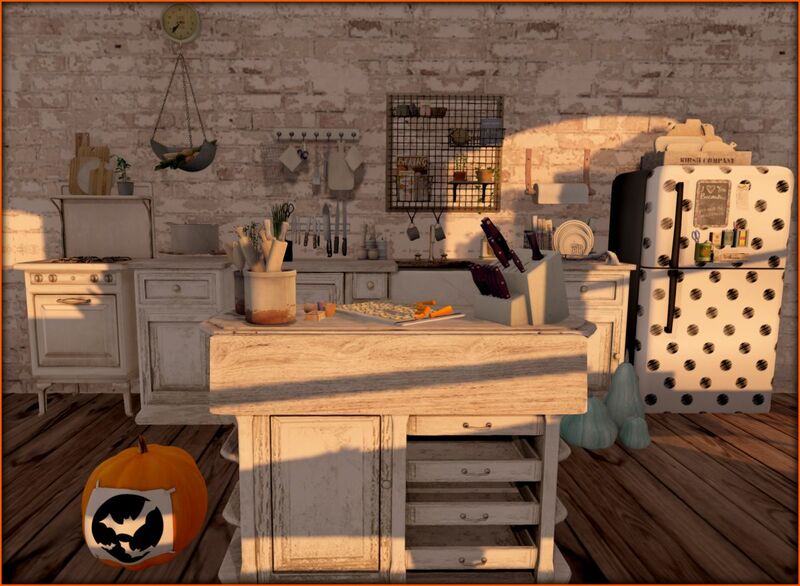 The house that I am standing in is new from DRD at Shiny Shabby. Hope is a thing with feathers.. I went to check out the book of Daniel and found a few pretty things, and you should too as it helps someone who is fighting Cancer. I found out some more info to post below to learn more about the event. “The Book of Daniel is an upcoming Fund-Raising Event, where you can shop to save a life. A talented SL creator and a dear friend of many, Daniel Estro, 29 years old, (co-owner of Zerkalo, Shiny Shabby and The Crossroads) has cancer and desperately needs our help. He is currently undergoing chemotherapy as well as radiotherapy. He is fighting as hard as he can to survive but as many of you might know, fighting cancer is very expensive. We have been trying our absolute best to help them financially and we still are. But we need your help. We are doing everything humanly possible and it’s just not enough. About 124 designers gathered together to help with their creations. You can help too ! Guess what? Collabor88 is open and it’s the Americana round. I am loving everything so far and put a few pictures together with some of my favorite things! I simply adore the Dust Bunny set this round, make sure you check it out! The Arcade has many gorgeous items this round. A few of my favorites are this cottage from Dust Bunny. It’s a rare but it’s gorgeous. If you win a rare from Dust Bunny you can trade it in for a copy version – which is something I need so I don’t lose it on accident! Another great thing are the dogs from O.M.E.N you can see my little dog on the porch and Wavie Haller of Consignment made this cars and the rare has a tree on the top. I am currently putting up my tree in SL so this car helps make a nice Christmas scene. The Arcade is mid-way through, so if there is something that you are wanting – now is a great time to go! I’m using pieces here from the Sari-Sari set, the Second Spaces set, the Razzberry set and the polka-dot fridge is from Pizza. The house in the photo is from Scarlet Creative. All of this you can get at the Arcade! The rest of the kitchen set is from Dust Bunny. My friend, Tinker Hax said that I reminded her of a Fembot from Austin Powers in this outfit and I kind of agree. It also made me want to watch Austin Powers again. The Arcade has been been open a little over a week now and have you been? Did you find everything that you want? My outfit is the rare negligee from Erratic and my hair is the blondes from Exile’s Twist and Shout. I love this hair and the bow on it even more. Is there something that you still want? Just about everything in this post can be found at the Arcade and I’ll put the credits below. Shift dress, and wood rack. Good morning! I have another post for the Arcade to show and again I went through and credited everything so hopefully if you see something you like you can easily locate it by name when you go play for it! We are into day five of the June Arcade, hopefully it will be a bit easier to get into now! Lelutka – Stella Mesh head with Glam Affair Vampire Appliers at We ❤ RP.